TP-Link MR200 is a LTE modem router unlike your usual wireless router. It comes with a LTE modem built in so you are able to plug in your SIM card and share the internet connection over Ethernet LAN and WiFi. With the rise of unlimited internet plans in Malaysia such as the recent Umobile unlimited LTE plan, there may be more and more users looking for such router especially at those areas where Unifi is still not available. Besides, if you stay at a location without wired internet coverage, this LTE wireless router is a good choice for you as well. My current setup involve using it at a remote location for surveillance camera coupled with TP-Link NC450. Here’s my review of TP-Link Archer MR200. The design of the device is really simple. The entire device is black in colour and the paint is really glossy. On the back, it has 2 removable LTE antennas. The antennas are really high quality unlike the one I got from my Huawei E5186. Besides, we have a bunch of Ethernet ports. They are 10/100 and not Gigabit capable. One of the ports is able to function as a WAN port. The SIM slot is situated at the back of the device as well. Moving on, the entire bottom of the device is filled with ventilating holes to cool the device. I like the fact that TP-Link included some MicroSIM and NanoSIM card adapters in the box. Standard SIM slot with Nano SIM and Micro SIM adapters included. I love the firmware on the MR200, it is a simple device to operate. It will guide you through a step-by-step guide to set up internet connection once you insert your SIM card and turn on the device. 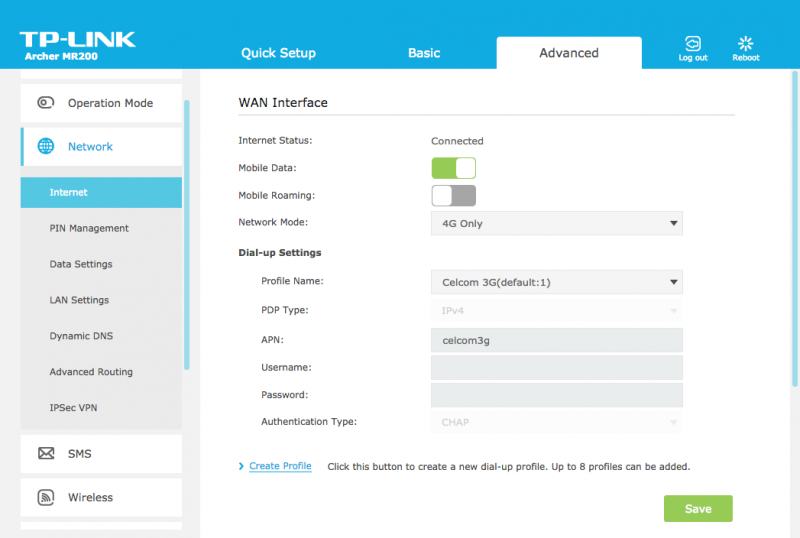 You do not need to manually configure the LTE profile as the router will sort everything out itself. You just need to set up the name and password of the new wireless network and you are good to go. I tested it with Celcom and Digi and it detects them automatically without having me to key in manually. 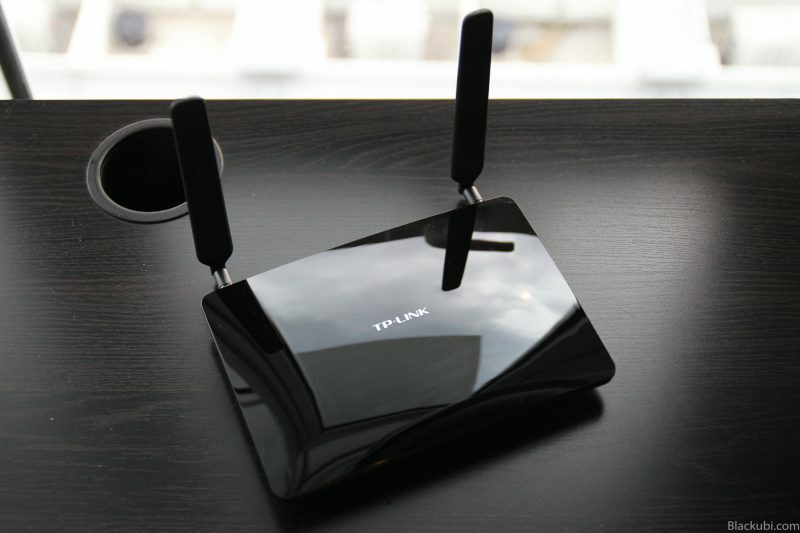 Feature wise, the offerings is much more than other LTE modem routers in the market. You are able to perform some basic bandwidth control and there is a parental control feature baked in. There is even an IPSec VPN client built in for some reasons. Of course, like all LTE router, the SMS feature is available as well. You are able to configure the monthly quota limit and there is a usage counter as well. One thing to note, the router doesn’t support phone call. If you are that kind of advanced user, this is the part for you. The router come with Native IPV6 support. I have no issue in obtaining IPV6 from both Celcom and Digi network. Moving on, if you no longer use LTE, this router can also function like a usual wireless router as one of the LAN ports is able to function as a WAN port. TP-Link MR200 come with a Category 3 Qualcomm based LTE modem which capable of throughput up to 150Mbps download and 50Mbps upload. I will start from the signal reception. I find it to be fine, on par with other device I have. 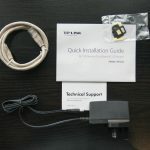 However, as both of the LTE antennas are removable, you can use it with an external antenna to improve the signal if you stay at some isolated location. However, you will not be able to adjust the band unlike some Huawei routers. I find that the signal stability of the MR200 is good and do not fluctuate a lot. Performance wise, it is alright for a Category 3 LTE router. 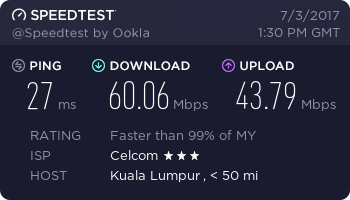 I used a Celcom SIM card and I am able to achieve a decent 40Mbps in a speedtest. Of course, the speed of the LTE network depends on the congestion at your location and the signal strength. The place I am testing the router have a good signal strength and I have direct view of the LTE base station. You may not be able to obtain the same speed as me. It may not be as fast as a Category 6 LTE modem router but it wasn’t far behind. If your location do not have LTE+ coverage, the performance is the same. TP-Link MR200 come with Wireless AC750 ability. Wireless AC is future proof and it performs much better than Wireless N. Besides, being a Wireless AC router, it is dual band capable so you will have less interference when using the 5Ghz band. If you do not need Wireless AC, there’s another model, the TP-LINK MR6400 with exactly the same specification but just Wireless N.
Wireless signal wise, it is decent enough to be able to enjoy full house coverage with decent performance. The wireless antennas are built in as the external antennas are used purely for LTE/3G connectivity. Wireless performance wise, I do not have an issue with it. I am able to get decent speed with the wireless on a LTE connection. I do not feel a difference in internet speed when connecting to the router either via wireless or Ethernet LAN. There isn’t much LTE modem router available in the Malaysian market. TP-Link MR200 is one of the more decent ones. It comes will decent warranty and offers a great value. It is priced at RM450 at the time of this article. Besides, the frequency is compatible with Malaysian LTE operators. Not to mention that the features it offers is great as well. With more and more people using LTE as their main internet, I find this router to be a good candidate for that. As a full fledge router, it performs better than a portable MiFi as it doesn’t overheat and shut down. Besides, the signal reception is stronger thanks to the external LTE antennas. One thing to note is I hope it comes with Gigabit Ethernet ports. On the performance side of things, it is a stable piece of equipment with good firmware support. If you stay at a location without LTE+ support, this router will not display any difference with a more expensive Cat6 LTE router. One thing I looking forward to is the ability to force the frequency of the LTE which is not available here. 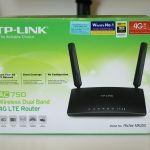 I definitely recommend this LTE wireless modem router, a solid replacement to a wired internet connection. Not to mention that it is able to perform much better than a portable MiFi as well. Yea, you can use the Archer C7 as the router and just relying on the MR200 as the Internet source. Do you intend to use the C7 to share the WiFi of the MR200? Are there any 4G LTE router higher performance that TP-Link Archer MR200? You can consider the Huawei B618 but it is really expensive. i buy one unit and start using for 1 week. My connection including wired device connect to LAN port showing dropping from 4G connection randomly ( It happen few times per days ). Each time i have to manually reboot it to access internet. 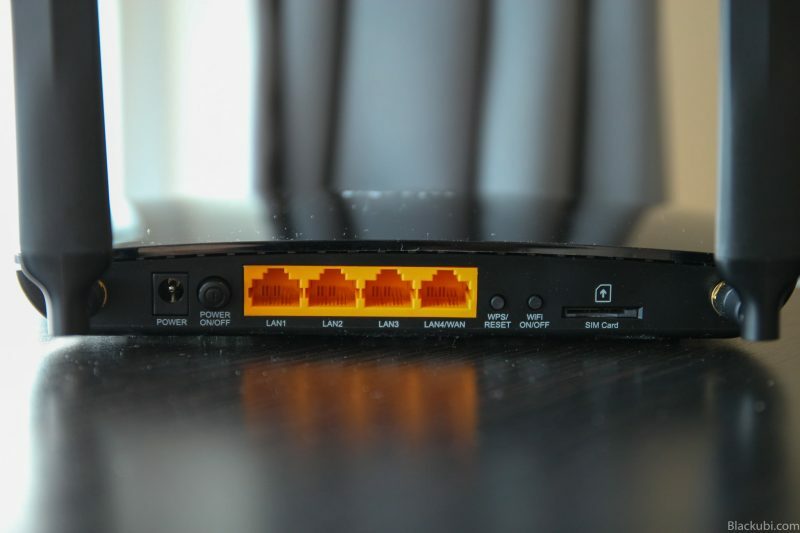 Mine was fine and I have a few friends with good experience with this router. Try updating the firmware and make sure you have good signal. 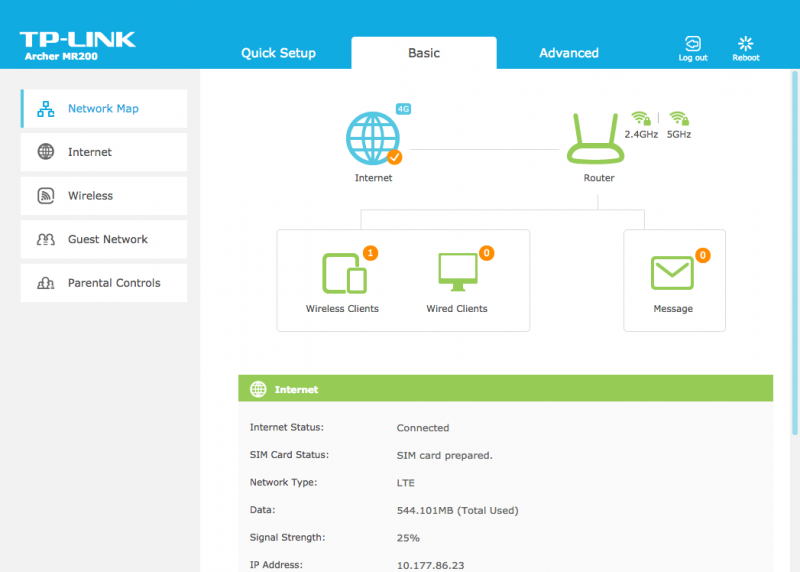 Are you able to test if TP-Link Tether app works with this LTE router.